So much to be excited about today.! First, I found a mobile dog groomer for Lola. Zooming Groomin. Don't you love the name? They have a 10' van and can fit her in. Her mats have got away from me and trying to wash and get them out while sitting on the ground outside is crazy. She gets ansty and wants to move. So, February 7, they will be zooming here to the park and she will be sweet smelling once again. Then I'm renting one of those industrial carpet cleaners to do the rug area. Ugh.! While we walk, Lola sometimes lunges and the muscle in my upper left arm has been injured. So, Roger made me a woven handle type lead that connects to her collar and I use that along with holding the long lead as we walk. It gives me more control. The other exciting thing is I have really started to work with her as we walk. I have her sit and stay every so often. I do the walk around and come back beside her. Other times it's a sit stay then a down. Near the end of our walk I let her have a long lead so she can sniff a bit but other than that it's a controlled walk. Today my friend Terri came over to the dog park fence. Lola ran to the fence barking. Knowing what your breed does helps and Lola wants to protect us. Terri told me to come between Lola and the fence and tell her to go back. I repeated this exercise a few times then Lola shook herself and went on to play with Sammy. Terri explained that Lola's shake was her releasing the tension that she needed to protect us. She would look over at us by the fence then go play again. So exciting to know what your dog's body language is telling you.!! The two Labs would wave at us if someone was coming over to the fence. 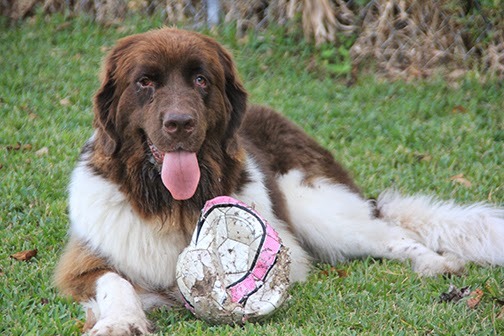 The Newfoundland's loyalty to their family is strong and she will protect. I feel so good knowing I can take that burden off of her but so honored that we have bonded so tightly that she wants to protect. Do you have a pet that is afraid of other dogs? Or in training? This company has leads that say "Caution" ,"No Dogs" or "In Training". I'm doing the happy dance here. We have met a few people with the retractable leads that just let their dogs come right over to us. Sammy is afraid and will react. He will get the No Dogs or Caution lead. Ozzie can have the "friendly" lead and Lola, "In Training" or the "if you want your tiny dog squished under Lola's paw come on over" lead! Having something that will alert people to my kids will take the stress off of me thus taking the stress from the lead that leads down to them. Then, tomorrow we are going on the Casino cruise out of Port Canaveral. Roger is staying home with the kids. About 21 people will be going from the park so pray for calm waters. Stocked up on dramamine! I'll let you know how it all goes if I'm still standing tomorrow night!! Good work with Lola. We face every walk with a fear aggressive dog. We just have to stay away from other people walking their dogs. I know we look very unfriendly when we turn and practically run away from people. I take carrots ( her favorite treat) and just keep walking, tell her to "leave it" and give her a carrot. Depends on how close the other dog is as to how well it works! I wish they would ban those retractable leads. Your cruise sounds like fun. A Cold Night Is Upon Us.